It is always rewarding to hear from recent students of the hypnotherapy course and below we will add recent comments from people who have completed their hypnotherapy training with Hypnotic World. You will also find more students' comments on our Testimonials page. I just want to say that I found the course most enjoyable. The modules were good bite sized chunks, looking at them all on my bookshelf now I am amazed I got though them all in such a short space of time, however that is true testimony to the way the course was written. I have recommended Hypnotic World to a number of NLP colleagues who are keen to progress through the hypnotherapy route, so you may have a wee influx of Scottish students! I began working for The County Council 10 years ago and alongside my day job became a support officer aiding fellow colleagues who were being bullied or harassed or accused of bullying or harassment in the work place. "Having spent more than twenty years in management and leadership roles in industry I realised that what I really wanted was to make a difference to people rather than organisations. I have always been fascinated with the power of the mind, and I truly believe that everyone has the potential to do, and be, and enjoy so much more than they can even imagine. 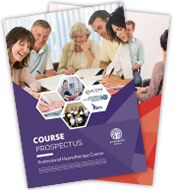 Having already completed a course in Life Coaching a couple of years ago I decided that what I really wanted was to learn the skills and techniques of Hypnotherapy. Much research on the internet followed with many training organisations contacted, until I got in touch with Faith Waude at Hypnotic World and signed up for the Diploma in Hypnotherapy course. The material is presented in 8 printed modules, with some complimentary CDs, Each module has a question paper to be completed and sent back in, and there's a final exam at the end of module 8. I was delighted with the quality of the material presented. This was not a course that was solely about learning some techniques and scripts, but rather a course that was designed to make you think, and analyse, and come to your own conclusions and decisions. The support from Faith was excellent. When I had questions, or felt uncertain about my responses to the questions, she was always able to help. Either giving me reassurance that I was on the right track, or gently pointing me in the right direction if that was necessary. I am now equipped to start my own Hypnotherapy practice and I look forward to helping people. For almost thirty years I have also suffered from an eye condition called Keratoconus and I am in the process of developing a confidence and self reliance program for people with eyesight related diseases or challenges. You can find out more about me at http://thenorthamptonhypnotherapist.com." "Whenever I try to write a bio the result seems like a feat of self-gratification: "I did this... I did that... I did the other..." No one achieves anything without help and support no matter how hard they try to be independent, so to remain brief and to the point I have to resist the temptation to involve descriptions of my wonderful family, and the friends who have also played their parts. My interest in hypnotherapy started in 1960 when I bought material from a Psychology Publishing company in Cheshire. In 1970 I worked through the book courses set out by William J. Ousby: 'Self Hypnosis and Scientific Suggestion', and 'Hetero-hypnoses: the theory and practice of Hypnotism'. That was many years ago and faded in memory, so I was really pleased when I had the opportunity to complete the hypnotherapy course with Hypnotic World. The material was comprehensive and presented in non-technical language that anyone could understand, and the feedback from Faith Waude to the module questions and the final exam papers was highly proficient and informative. It is gratifying for me to be associated with a such a competent and professional group of people who practice and teach hypnotherapy. For anyone thinking of a new/alternative/additional profession, or who is returning to education, the hypnotherapy course presented by Hypnotic World is highly recommended." "After a successful retail management career from my early to mid twenties, I began a career in care in 2004. I have worked in all areas of care from clinical, community, secure units and residential care. I completed a foundation degree in 2007 in caring for children with complex and continuing health care needs and continued my studies with NVQ's 3 in health and social care and team leading. Recently I have completed a level 4 diploma in counselling and psychotherapy and this is where I discovered my interest and love of hypnotherapy. I have now successfully completed a diploma with the wonderful Hypnotic World! I work with clients with learning disabilities and dementia and I am always trying to find ways to enhance communication and promote a person centred holistic care approach. Many of my clients are palliative care and therefore experience pain and discomfort and a difficulty in enjoying calmness and relaxation. I believe I can help to provide this with a combination of counselling and hypnotherapy. As well as serve other individuals with therapy that is tailored to their specific needs. I am passionate about care of the elderly and vulnerable adults and children. I feel that there is not enough provision for mental health towards end of life, during a time when it is more important than ever to ensure meaningful relationships and communication are available and accessible in order to sustain a sense of who we are. I am married with a beautiful daughter whom I adore and 4 fabulous cats. I enjoy reading, cooking and arts and crafts." "River Roman is a Certified Clinical Hypnotherapist with a private practice in British Columbia, Canada. He works with those dealing with issues such as PTSD, pain management, fears and phobias as well as many other issues. For more information please visit River's website at www.yourhealinghypnosis.com/. "I would first like to thank Faith Waude for all her help and support throughout my Professional Hypnotherapy training with Hypnotic World. I have gained a wealth of knowledge, and I am more confident with my abilities and the added tools that I have gained which will enable me to help more people through Hypnosis. I have & will continue to recommend Hypnotic World's training to all of those who are thinking about learning Hypnotherapy as it is very in depth and well round with the added value of being Pay As You Go and all the ongoing support that is available. I have been interested in Hypnotherapy since being a teenager and it wasn't until I did my NLP Practitioner training that it sparked the desire for me to get more knowledge on Hypnotherapy. I am very passionate about this business and I enjoy helping people achieve their goals and enhance their wellbeing. I am also a Reiki Master (Usui Shiki Ryoho Reiki & Karuna Reiki® Master). I am qualified in NLP & EFT Practitioner and now Hypnotherapy"
"I wish to thank Faith Waude for her help and support throughout my Hypnotherapy training with Hypnotic World. This has provided me with a wealth of knowledge, confidence and tools to help people via hypnosis. I will recommend Hypnotic World training to all those who are thinking about learning Hypnotherapy. I have over 9 years' experience as a Complementary Therapist working in the Lincoln area, and I bring forward into my practice 20 years of experience of being a Staff Nurse, working in the NHS and at St. Barnabas Hospice. Over the years I have increasingly recognised the health benefits of using complementary therapies alongside conventional medicine. I am registered on the NHS Directory of Complementary and Alternative Practitioners, run by the NHS Trusts Association. I am passionate about my business and I enjoy giving my clients individual holistic care to enhance their wellbeing. I have a natural caring instinct and a thirst for knowledge and enjoy teaching my students. I specialise in Reiki, and as a Reiki Master / Teacher run Reiki Classes. I am qualified in EFT and have done training seminars with Gary Craig its founder. I also bring to my practice Crystal Healing and Hopi Ear Candle Therapy. I now add Hypnotherapy to my skill base and I particularly find Past Life Regression fascinating, with its ability to help us in our present life time. I also specialise in weight loss, bringing forward personal experience, empathy, knowledge and motivation to help my clients to the full. For more information please visit www.vibranthealth.info. 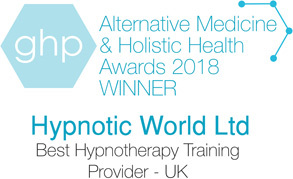 "Thanks to Hypnotic World's comprehensive Diploma in Hypnotherapy programme for providing me with the skill and confidence to help people lose weight through hypnosis. Faith Waude and her team were totally responsive to any queries I had and I now regard her and her website as a great source of knowledge. I really appreciate that the advice provided on the 8 modules programme includes setting up your own practice, marketing and managing PR and website presence. I practice in York, Leeds and Northallerton - specialising in weight loss." I qualified in 1976 in Human Movement Studies and Sports Psychology from the University of Leeds (TASC). I attended Harvard Business School's executive programme in 2000 where I learned about the psychology of leadership, individuals and teams. I am an NLP Master Practitioner (Design Human Engineering) having trained with Richard Bandler and John La Valle in Toronto, 1994. My research in NLP and NLP Metaprograms has led to my inventing and launching a worldwide online tool that is registered with The British Psychological Society that provides insight into motivation and preferences and interpersonal relationships. I work with organisations and individuals to help them achieve their goals. My passion and curiosity is understanding the motivations and preferences that drive behaviour. I am married with 5 children and enjoy spending time with my family, cooking and live music. I 'busk' piano and saxophone. You have nothing to lose (except those extra pounds) by contacting David Foggin to receive a free initial consultation! You can read other students' comments on the testimonials page which can be found here.